The spirit of Easter is all about hope, love and new beginnings. 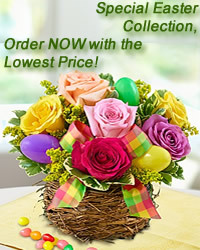 Congratulate Your nearest and dearest people in Armenia, choosing a perfect gift from our wide and unique assortment of Easter flowers, gifts and treats. The delivery is organized in a few hours, moreover, we offer a free delivery in Yerevan!